On request the car can be fitted with a quick tyre repair kit, called “Fix & Go”, replacing the common tool kit and the spare wheel. 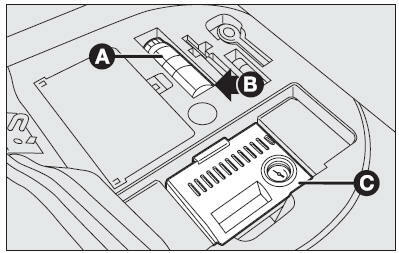 a compressor (C) including gauge, connections and tool for removing the valve body; the latter can be found by opening the compressor slide lid (D). IMPORTANT If puncture has been caused by foreign bodies, it is possible to repair tyres showing damages up to max 4 mm diameter. : tyre areas NOT repairable. 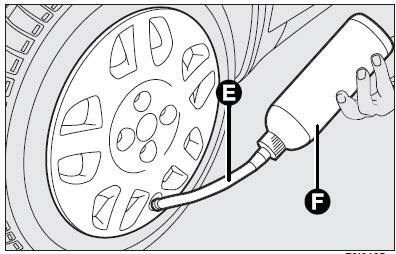 IMPORTANT Holes and damages on the tyre side walls cannot be repaired; permanent sealing of damages located on tyre tread within 25 mm from tyre side wall is not guaranteed. Check tyre side walls accurately. IMPORTANT Do not use the quick tyre repair kit if damaging is due to running with flat tyre. It should be noticed that: The sealing fluid of the quick tyre repair kit, effective with external temperatures between –30ºC and +80ºC, is not suitable for final repair. 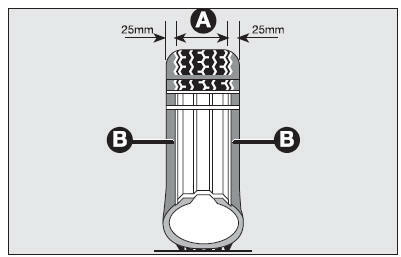 The fluid inside the tyre can be easily removed with water. The sealing fluid has unlimited life. 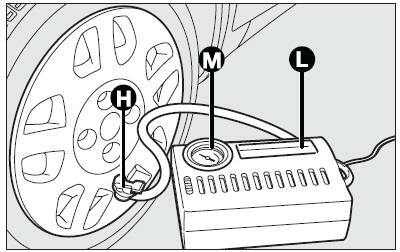 in case of damages on the wheel rim (bad groove distortion causing air loss) or tyre out of the limit areas previously described. Do not remove foreign bodies (screws or nails) from the tyre. contains propylene glycol; this substance can be harmful and irritant: do not swallow and avoid contact with eyes, skin and clothes; in case of contact rinse immediately with water. Call the doctor in case of allergic reactions. 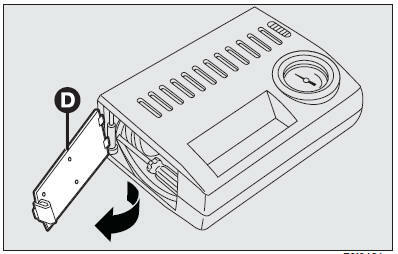 Keep the cylinder in the case provided for the purpose and far from heat or children. be operated for more than 20 minutes. Risk of overheating! IMPORTANT Tyre repaired with this kit can be used only temporarily. 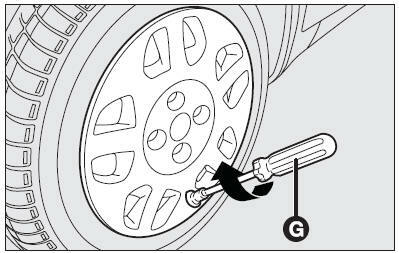 visible position for the driver to indicate that the tyre has been treated with the quick tyre repair kit. Drive carefully especially when cornering. Do not exceed 80 km/h and avoid heavy braking and accelerating. below 1.3 bar, stop immediately and contact Fiat Dealership. If read pressure is equal to at least 1.3 bar, restore proper pressure (engine running and handbrake on) and then drive with the utmost care. 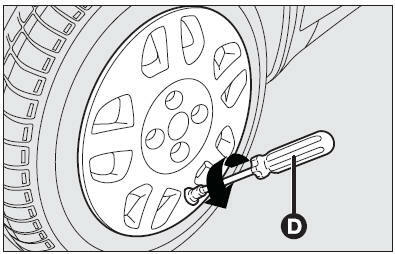 pressure it is impossible to reach at least 1.8 bar, stop immediately since the tyre is too damaged and the quick repair kit cannot guarantee proper seal, contact Fiat Dealership.